Asus T101MT, onboard oversized on start (Gnome Classis, Ubuntu 12.04). Please maximize it at all width of the screen. I have tested the Trunk version. and after sudo ./setup.py install. 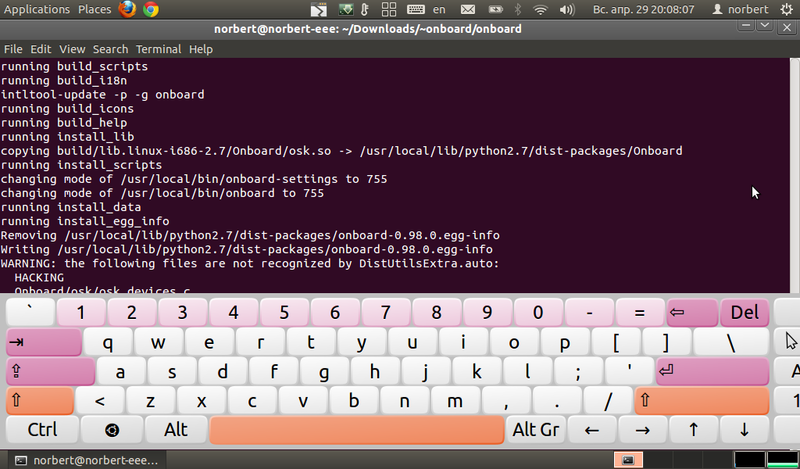 But the onboard is still oversized, see screenshot. It's wider than the screen. Thank you! It looks like something went wrong when resizing the window. The move button obviously shouldn't become unreachable. Do you remember what you did right before the window got into that state? After you have done this, please try resizing the window again. The move button is supposed to snap into view after each resize action (also when hiding and on exit). Let me know if that happens. No I found new error about 'org' and 'apps', see https://bugs.launchpad.net/ubuntu/+source/onboard/+bug/991384. Okay, I solved the new problem, so I can return to the origin. My screen is 1024px wide, so I wonder oversize at next boot. You might try to disable the force window to the top option. Onboard might then be aware that it does not fit on the screen and resize itself. Then resize it manually to your desired size and wait a bit for Onboard to store the new size to the preferences. Finally, you can re-enable force to top mode. I compiled deb package of rev 822. Keyboard has correct size and don't change it width between reboots. According to comment #6 this bug wasn't an issue anymore with trunk. However an actual check if Onboard fits on screen was still missing. I've added that now with commit 920.